My gripe is broken glass and how dangerous this debris can be for dogs. My son's dog "Dandy", a spaniel has cut her paws several times now on broken glass in the streets near where we live. Everywhere I walk with or without Dandy there is broken glass on pavement, parks and in the streets. Why are people so irresponsible as to leave glass bottles around so that they get broken? Dont they know how potentially harmful it is to kids and pets? It's not just the fact that broken glass is a danger to dogs and the inevitable cuts on paws, it's also the thought that a child might end up falling on this glass and and cutting themselves badly. 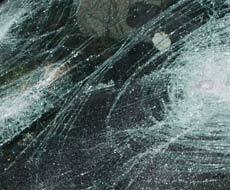 In large enough quantities broken glass can do a lot of damage and there's certainly enough of it out there. I live opposite a cricket field were there are seats and young people use them to get drunk, especially at weekends. Further down is the football field and at the very end are swings for the kids but the same happens there. At the end of the weekend theres always more broken glass. The bin men recently got a pay rise, presumably because the men who brush the streets and parks etc. were on strike, but I haven't seen them about lately. So I go out and pick up the broken glass myself so that the dog can be walked safely. I carry a plastic bag, brush and shovel every time I go out because there's so much of it out there. So many dogs so few recipes. Was a comment made by a comedian on the TV . I would like to say there is not a problem with dogs, but there is a problem with dog owners. Dogs do not belong in towns, flats or small houses with little gardens. It is cruel keeping a dog in a town, they just don't belong there. Dogs are not toys or replacement or a substitute for human relationships. A Furby toy is a far more intelligent and much safer and they don't poo up the town, blind or poison children. Since dog sh1t is littering our streets, on the balance of things, this sounds just about right doesn't it? Its not only dogs that suffer cuts from broken glass, its kids as well. Im forever having to steer my 4 year old around broken glass when were on our way to nursery. And why blame the child or dog for not watching where they are going when the glass shouldnt be there in the first place? Try telling the thick ***** that smash it all over in the first place!! Zero tolerance for dogs pooing everywhere. On the 2nd occasion the dog should be put down. In a well known Norfolk seaside town ( and I mean Well known) the council proudly announced in the local press that five people were successfully prosercuted in 2011 for dog fouling. The fines ranged from Â£25 to having small amounts taken from their benifits. Now thats what I call a deterrant for this disgusting, anti-social behavior. The council signs along the sea front warn of a Â£500 fine if caught, seems to me that the magistrates that hand out these fines are also bad dog owners. Hound Dog, you blame the "stupid mutt" for not looking where it was going but say nothing about the main subject here which is mindless half-wits who think it's a giggle to smash a bottle on the street?.....that ok presumably? As for fouling, responsible dog owners are as appalled as the rest when it comes to people not picking it up - trust me. Dogs are just as much to blame as their human counterparts.We are always quick to complain about dogs fouling the pavements & having to put up with stepping over their own mess.I blame the stupid dog.Stupid mutt should have looked where it was going. I hate it too, where I live is normally quite a nice place until some people (Mid 30's I reckon) moved in down the road, always smashing bottles leaving cigarettes around and generally causing a nuisance. The dog walks have become a nightmare, every other day my poor dog has glass in her feet and I get really worried about it. Also, don't just blame kids, I'm 18 and I'm nothing like that. Is it the sad and lonely who come to comment here....because if so I am one of them. Could you not buy your little chump some doggie shoes ??? ?....our little pets are exposed to such dangers unfortunately..